You can tell Easter is fast approaching when you start seeing egg and bunny-shaped candy, cards and gifts start popping up in stores. This is a holiday that Christians and non-Christians alike celebrate, whether in a religious sense or just taking part in the traditional Easter egg hunt. This is a very exciting holiday for kids. They look forward to the Easter Bunny hiding eggs for them to seek, the decorative baskets and candy, and the enjoyment of the festivities. As busy parents, we know that you don’t always have adequate time to sit down and plan these things out, so we thought we’d help you out. We’ve compiled a list of simple decorating tips and ideas for eggs, Easter baskets and crafts as well as ideas for themed games, food, desserts and more—that won’t use up all of your time or patience. Most of these items can be found around your house, so that will save you time, money and stress! However your family decides to celebrate, with these tips you’ll be sure to find some simple and enjoyable activities for your kids to enjoy. 1. First things first – Egg decorating: There are endless, creative and age-appropriate ways for you and your kids to enjoy decorating Easter eggs. 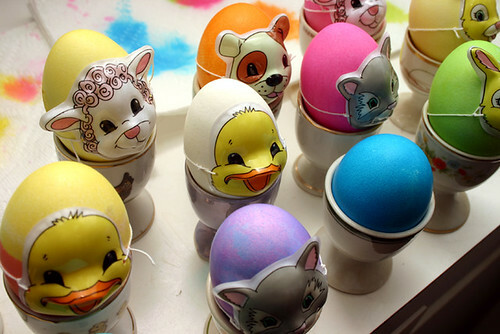 -Dye, crayons, food coloring, watercolors and paint are great basic ideas for adding color to those ordinary eggs. If you have younger children, safe and easy ideas for them can be using stickers to add character and personality or giving them a glue stick and letting them spruce them up with cotton balls, shapes cut out of paper, glitter or any other household items you have laying around that could work for these crafts. 2. To properly hunt these newly decorated treasures, you’ve got to have the proper basket: Now these can be as minimal or as fancy as your budget or patience allow. -Wicker baskets: Ribbon and lace work great for wrapping around the handle or tying bows around the body. You can even personalize the ribbon with their name for a special, added touch. -If you want something a little more affordable , you can buy Easter-themed plastic buckets from any dollar store or party store. If you’d rather decorate your own, buy a solid plastic bucket and use paint or markers to decorate with your child’s name or a personalized message. -Using cut up paper, paper from your paper shredder, spray-painted packer peanuts, fake Easter grass, moss twig or grass, let your little ones build their own nests to put their Easter eggs in. -Use construction paper, pipe cleaners, popsicle sticks, stir sticks or any other items around your house to let your kids build and decorate their own crosses. -Cut bunny shapes out of construction paper and let them glue cotton balls on them to bring their Easter bunnies to life. 5. 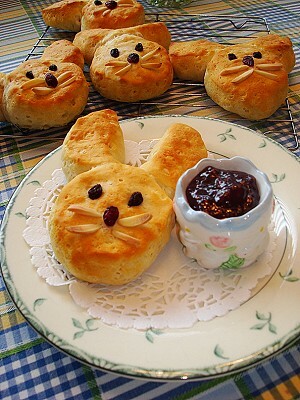 Easter-Themed Food and Desserts: Eating can be a fun activity when food is shaped into festive objects. There are several foods that can easily be shaped into bunnies or eggs or whatever fun shapes you desire. Turn mealtime into a creative activity. -Or if you want to be daring, make cupcakes or a cake and let your kids go crazy decorating their own with frosting, sprinkles, candy or whatever your imagination can come up with. We don’t want holidays to add any stress to your lives, so we hope you find some of these ideas to be easy and inventive ways to keep your kids entertained and to enjoy this time with your family. The more involved they get to be in the projects, the more fun they’ll have and the more excited they’ll be.